Cricket Opens Doors on Sunday for Youth | The International Cricket Hall of Fame. Cricket NSW is embarking on a grassroots revolution by offering Twenty20 cricket on Sunday for juniors through its Mosaic Programs in its pursuit to be a sport for all Australians. 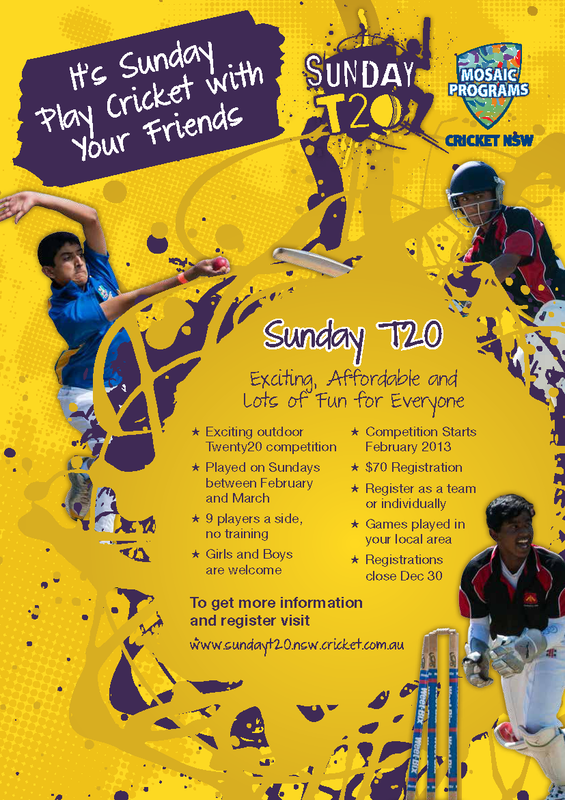 Cricket NSW today launched its SundayT20 program in partnership with pilot Cricket Associations in Western and South Western Sydney. Built on the highly successful Twenty20 format, the program is a 9 a side cricket competition for all junior girls and boys from under 10s to under 16s. The competition will be played from February to the end of March. NSW Speed Blitz Blues Player and Mosaic Programs Ambassador Moises Henriques in launching the program said “SundayT20 is a whole new ball game and it is a great opportunity for families to be part of our game and enjoy all that it has to offer on what may be a more suitable day of the week”. He added, “With its focus on participation and inclusion, featuring batting and bowling rotations, SundayT20 is just the program for those who want to do something fun and active on Sunday in the peak of the summer cricket season”. Cricket NSW Game Development Manager Cameron French said “This program and its short format is exactly what we need to offer families juggling multiple weekend commitments. Who knows? – Our next Moises Henriques or Lisa Sthalekar might start their Australian career here”. Cricket NSW Emerging Markets Leader and program coordinator, Sam Almaliki, who is also the pioneer of the Sydney Sunday Winter Cricket Program, said “In terms of junior cricket this is revolutionary as we are determined to make the game accessible to all Australians. It’s exciting for our multicultural communities and families who have Saturday school or work commitments. Now they can take their child to play Australia’s iconic sport on Sunday”.